Posted on 6, December 2018 by EuropaWire PR Editors | This entry was posted in Awards, Chemicals, Education, Netherlands, Science, Small Business, Technology and tagged Catarina Esteves, CHAINS 2018, chemical, chemical start-up, Dr. Cristianne Rijcken, Dr. Koen Nickmans, Dr. Peter Berben, Emiel Hensen, Leon Joore, Lourens Bout, Lusoco, Michael Boot, Michael Debije, Panos Kouris, Prof. Floris Rutjes, spinoff, Sponsh, startup, textile, Vertoro, WATER. Bookmark the permalink. 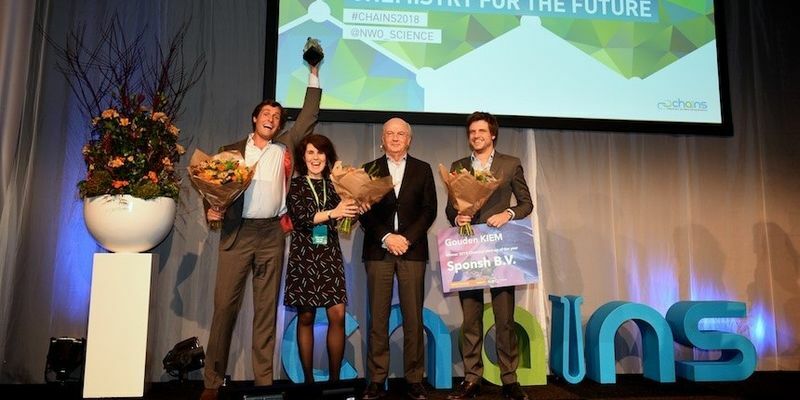 EINDHOVEN, 06-Dec-2018 — /EuropaWire/ — Sponsh, an Eindhoven University of Technology spin-off that develops a temperature-sensitive textile which produces water from the air, has been voted the best chemical start-up of 2018. It is the third consecutive year that a TU/e startup has won this prize. Moreover, this year the other two nominees, Vertoro and Lusoco, were also TU/e initiatives. Yesterday, founders Catarina Esteves and Lourens Bout of Sponsh received the Golden KIEM 2018 from NWO, the Top Sector Chemistry and InnovationLink. The prize consists of 25,000 euros and a sculpture. The announcement was made last night at the CHAINS Chemistry Congress. This year’s jury consisted of Prof. Floris Rutjes (RU), Dr. Peter Berben (BASF), Leon Joore (Millvision), Dr. Cristianne Rijcken (Cristal Therapeutics) and Dr. Koen Nickmans (FreshStrips). The jury was impressed by the enthusiasm and innovative ideas of the three startups, awarding the Gouden KIEM to the company in which the jury saw the strongest combination between a product with social impact, a good team with complementary expertise and good opportunities for further growth. During the CHAINS chemistry conference the winner of the Holland Chemistry Student Competition was also announced, and here too there was a TU/e winner. Student Roel Borgers and Sophie de Lange of Wageningen University & Research – participating together as team Beads vs Beads – won the check for 1000 euros for the ‘metafoam’ they had developed, a material that ensures a better and more efficient insulation of low-frequency noise. After TUSTI in 2017 and FreshStrips in 2016, Sponsh is the third Eindhoven University of Technology spin-off in a row to win the Gouden Kiem. The temperature-sensitive textiles developed by researcher Catarina Esteves five years ago can provide a solution to the shortage of clean water in hot, dry areas. The technology draws its inspiration from the Namibian desert beetle which has hydrophilic (attracting water) and hydrophobic (repelling water) areas on its skin to collect water. At night, Sponsh has a highly absorbent character and extracts water from the cool, misty air, while during the day, at warmer temperatures, it releases precisely the water collected at night. The material can produce up to three times its own weight in water. A square meter of this special cotton can produce more than one liter of water per night. The expectation is that the first Sponsh products will appear on the market in 2020. The other nominated startups were Lusoco and Vertoro. Lusoco develops inks and components for printing artistic glass that produces energy during the day and emits light at night for use in information signs and architecture. Lusoco is an initiative of postdoc Jeroen ter Schiphorst and Teun Wagenmakers. According to the founders, the technology contributes to energy-neutral building. In the Netherlands, all buildings must be energy-neutral by 2021. The technology used is based on so-called luminescent solar concentrators, a technology that has been rapidly improved in recent years through research by TU/e professor Michael Debije. Founder Wagenaar was previously behind the small company Peer+, which developed windows that could switch between light and dark. Peer+ was acquired by Merck in 2014. Vertoro aims to be a platform for lignin-based crude oil, a substance extracted from biomass. This lignin oil can – just like crude oil – not only serve as fuel, but also as a raw material for (bio)plastics and chemicals. The people behind Vertoro B.V. are professor Emiel Hensen, PhD student Panos Kouris and Michael Boot. ‘Vertoro’ is Spanish for ‘the green gold’. In the crude lignin oil, the company sees a sustainable equivalent of the fossil crude oil. They compare their technology to making an espresso: they mix a brown powder (in this case lignin) with a solvent at relatively normal temperature and pressure. This is much more energy- efficient than most other methods used to convert lignin.